Firing Current : 1.2 Amps. Firing Tension : 1500 Volts. Firing Tension : 510 Volts. We manufacture Exploder approved by "The Central Mining And Research Institute, (CMRI) DHANBAD Govt. of INDIA body under Council of Scientific & Industrial Research (CSIR). The other blasting accessories we deal in are blasting cable, Lead wire, Mining Shoes, Helmets. Electric Siren , Hand Siren etc. 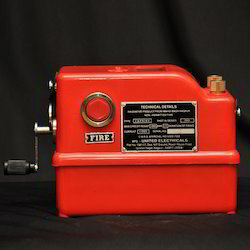 - Duration of firing current: Less than 4 Millisecond. 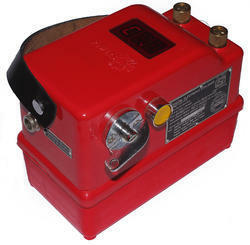 POWERBLAST 200CT DYNAMO CONDENSOR TYPE EXPLODER SUITABLE TO FIRE ONE SHOT TO TWO HUNDRED SHOTS IN SERIES WITH INBUILT CHARGING METER AND CONTINUITY INDICATOR. CMRI TESTED FOR COMPLETE IS:9836/1981 SPECIFICATION AND BIS LICENCE NO. CM/L-7199185 FOR ISI MARK. We market 12, 30, 100 & 200 shot state of art "AMA" brand exploder, These exploder have charge, continuity and low battery indicator. The units are rechargeable type. - Flexible & easy to operate, storage & transport.